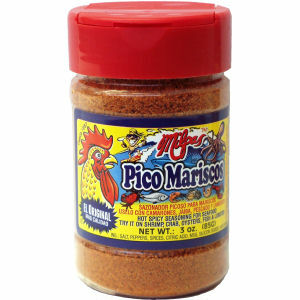 Milpas special blend of ground chili has been added to a seafood seasoning in order to produce a spicy Mexican flavor. Our seasoning can be used as an ingredient for spicy seafood stews or even for table top seasoning for oysters on the half shell. If you enjoy spicy shrimp cocktails, go ahead and sprinkle Milpas Pico Marisco on your next seafood dish!